On February 1, the New York Times ran an article about DC’s intention to do a sequel of Watchmen. It will be, actually, a series of prequels of some of the characters. Alan Moore, the creator of that seminal work, is not happy. Many people are not happy with this development. The prequel is not a labor of love or even of any particular creativity. Other writers will be brought in, as will other artists. In this world of corporate decision, both are interchangeable; the created idea is merely a vehicle for their cheap expansions, their desperation to continue to be relevant in the field. We have only to peruse the movie industry’s past to gather in bucketsful of sequels, each cheaper, sillier and more insulting than the last. So why am I so pee-o’d about this? After all, I just finished a book for Terry Nantier (Inner Sanctum) and I think fair questions would be—did an old classic radio show need a sequel? Did a radio show that depended on the audience’s imagination need me to illustrate their stories? But our take on Inner Sanctum is neither a prequel nor sequel. It’s a visualization of what was sound—glorious, crafted scripts that I listened to and was fascinated by. I don’t think the writers of that show would be insulted by my illustrating their words. They might even be pleased. But I don’t plan on doing prequels to known strips or comics. Moore described the contracts he signed with DC as “draconian”. That sounds like a sentence for imprisonment. What it was, was a “boiler plate” contract—we own everything and you own nothing. We do as we please with your creation and you have not a blessed thing to say or do about it. Some of us still remember the checks we were paid with by all the companies; on the back was printed something along those lines, exemplified by the one phrase “work for hire”. When you endorsed that check, you agreed to its terms. It took a long time to get rid of that phrase—but nothing has changed. You were, and still are, a hired hand. I know exactly how Alan Moore feels. Amethyst, Princess of the Gemworld was a shining point in my professional career. When Dan Mishkin and Gary Cohn approached me to join them in creating this lovely character, I was absolutely thrilled. We succeeded in bringing to DC, an audience of young girls along with the adventure-loving boys. Girls were rarely a factor in superhero and male-dominated fantasies. We were proud of that. When the series ended at the 12th issue, we hit a wall. I was on my way out of DC as editor, and Dan and Gary went their ways. Bone up on business. Specifically the business of comics publishing. If they’re going to screw you—and they will–at least have some knowledge of the tools with which they’ll do the deed. If you decide to go ahead even knowing the screwing is about to begin, do it for the rent and do not look back. Two people–in one week–asked me if I was still drawing. I hadn’t seen them since the last charity event, maybe a year ago. When they ask me, they make a scribbling motion in the air as if they were asking for the check. It isn’t the first time someone poses that question. Late at night, my wife Ruth says goodnight and asks what I’m doing. Drawing I say, shrugging my shoulders. Trying Sketchbook Pro, Smoothdraw, Softdraw, Art Rage, Manga Studio, sketching zombies, space probers, German soldiers…everything that doesn’t bring in a dime. Do the library often, load up with GNs. Occasionally I find a new artist, or a GN I haven’t read yet. 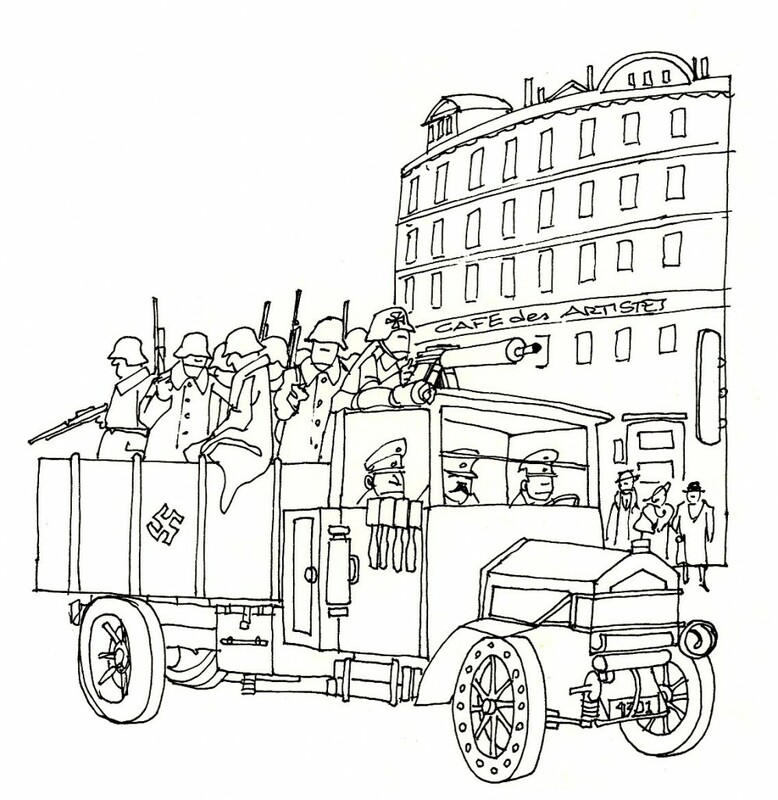 A recent, late, discovery was Jaques Tardi–wonderful, total cartoonist. Working paperless is like only eating potatoes. Makes me hunger for some of the things that were; paper, pencil, ballpoint, crowquill. Then I wind up scanning it all anyway, so I can color it, letter it, panel it. It’s all drawing–so–what difference? Some of the Inner Sanctum book was done in ballpoint, scanned and washed in Photoshop. One of the formats I go to again and again, is vector. It has a lovely clean look I like–but it is so laborious and so not intuitive. It requires more structure. Doesn’t lend itself to lazy artists. This is a small experiment in vector I did for a project my partner and I are working on, 3/5ths of a Man, The History of Slavery in America. Would love to do it like this, but I don’t have ten years and I don’t have a team. It can be done, of course, with tempera–now I think of it. Of course, that wouldn’t have the advantage of vector’s small file size. Is that relevant anymore? Can anyone tell me? After the jump, check out several pieces of Ernie Colón’s presented for the very first time. The lights had to be out—complete darkness, ear pressed against the set. Raymond, with his insane laughter, would introduce the story, first bantering with the tea lady selling Lipton’s. I backed away from the commercials, not wanting to break the spell that was already settling over me, of anticipation. Then back to mad Raymond. What was the story tonight—“The Horla”? Where a concert pianist hears and sees a grotesque monster in his own penthouse home? Or “Alive in the Grave”, a horror tale of a man possibly buried alive. Maybe “Death of a Doll” about a possessed child’s toy, perhaps possessing whoever touched it. Or, one of my favorites, “The Undead”, a man who wants to be a vampire! Then, my own story—which would have been perfect for “Inner Sanctum” (I modestly believe)—“Mentalo”, about a magician who does…real magic. This was the time of “Cat People”, the movie that relied on the power of suggestion, rather than in your face graphic monsters. Those lucky enough to have seen this little masterpiece will remember that the monster—in this case a woman who turns into a panther—is never actually seen doing so. But the chills are there—in your mind—as you fill in the deliberate spaces the director (Jacques Tourneur) has structured for your head. Inner Sanctum filled my head with those suggestions and spaces. Comics, not often enough, accomplish the same suggestive stories and scenes—in spite of being a graphic medium—but I elected to draw the graphic images. We live in the most visually oriented society the world has ever known. From TV, to movies, to magazines, newspapers in full color, to mobile devices, no corner of the world or of human experience is excepted. We watch—in real time—Quadaffi’s brutal death, surveillance cameras show a kidnapper in the act and horror series where nothing is left to the imagination. Well…times when I miss my imagination. I don’t want every single space to be filled by someone else. I hope I’ll be forgiven for filling in the spaces so skillfully left to us by programs like “Inner Sanctum”, “Suspense”, and…”Lights Out”.